Glenn McGillivray is Managing Director of the Institute for Catastrophic Loss Reduction. Prior to joining ICLR, he served as Assistant Vice President of Corporate Communications for Swiss Reinsurance Company Canada and was Corporate Secretary for three Swiss Re operations in the country. He began his insurance career at Toronto-based the Personal Insurance Company of Canada and went on to work for a major Canadian corporate law firm before joining Swiss Re in 1994 and the ICLR in November, 2005. Glenn has written more than 200 publications, journal, magazine articles and blogposts on a range of industry issues for Canadian Underwriter, Canadian Insurance, Municipal World, Disaster Management Canada and Canadian Consulting Engineer magazines, as well as for the International Journal of Insurance Law. Additionally, he speaks and lectures regularly on subjects related to the area of property and casualty insurance and reinsurance. Glenn is author of the Swiss Re publications “Cross-border litigation in the age of free trade”; “Twister: The professional reinsurer’s perspective”; and “Inside an Icestorm”. His work has appeared in the Financial Times of London’s Reinsurance Survey. He holds a B.A. in political science from Wilfrid Laurier University, a M.A. in political science from McMaster University, and a graduate diploma in corporate communication from Seneca College. On a recent long haul flight I finally broke down and watched ‘Only the Brave’, the 2017 Josh Brolin movie about the 19 wildland firefighters killed at Yarnell Hill, Arizona in June, 2013. Up to that point, I had refused to watch the movie, thinking that it would likely romanticize wildland firefighting and demonize wildland fire. I refused to watch the movie like I refuse to call the Fort McMurray wildfire ‘The Beast’, an overly romantic moniker coined by the now retired fire chief of that city who gave the fire the qualities of an evil, soulless creature. I didn’t (and still don’t) see the benefits of animorphizing the fire, making it seem like a rational, calculating, punitive creature. In my view, it helps no one to imply that such a fire is some kind of intentional being with a mind of its own. We won’t work to prevent such an event from reoccurring with such a mindset. The idea of ‘protecting’ a forest against fire is largely the wrong stance to take (especially in Canada’s boreal forest, which needs fire for its own good). It is this ‘suppression at all costs’ mentality that has gotten many North American jurisdictions into the mess they are currently in, i.e. where years of successful suppression has ensured that wildlands are choked with fuel that’s now just waiting to go up like a tinder. In large measure, saying we need to stop fire on the landscape is akin to saying we have to stop the wind or the rain. But I don’t wish to spend my time here talking about the issue of suppression. I deal with that here. Instead, I want to put forth an idea of how we can better understand the interface fire problem (i.e. the issue of fire getting into communities), at least partly by looking at what we’ve learned from the past. In the distant past, several major cities, mostly in Western Europe and North America, have experienced large conflagrations caused by one thing or another (like rambunctious cows). Fires in such places as London, New York, Toronto, Chicago and San Francisco lead to many changes in how cities are designed, how buildings are constructed, and in fire education and safety. I suspect that these fires were largely viewed in technical terms and, thus, were seen as addressable, where measures could be put into place to prevent or, at the very least, reduce the risk of reoccurrences. Firewalls were placed within and between buildings; openings (like small windows) were limited on the exposure sides of buildings; fire doors became common; buildings were outfitted with fire alarms, suppression equipment with dedicated water supplies and, from the late 19th century, sprinkler systems; less wood was used in construction; open flames were limited, and so on. Parallel to these efforts came the rise of education programs to inform people about the risk of fire and actions they could take to limit ignitions and spread. Over time, both the frequency and severity of urban fires dropped precipitously, to the point where fires are no longer a major cause of death and the main cause of insured property damage in most industrialized countries. These actions are essentially early examples of risk management and are largely still in practice today. Indeed, it is still common for the risk manager of, say, a factory or mill to do a walk around of a site and make recommendations about how to prevent ignition and spread of fire. But we don’t take this approach with homes in the interface. Why? 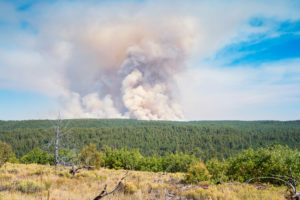 First, wildfires are viewed as ‘natural disasters’, and there is a widespread view that “nothing can be done about natural disasters” – they occur at the whim of Mother Nature. Really, though, a wildfire is a natural hazard, the disaster comes when the hazard exploits manmade vulnerabilities. I think the view that losses are inevitable when a hazard strikes is leading to inaction when it comes to wildland fire. For some reason, we treat the prevention of interface fires differently than we treat the prevention of other fires. But fire is fire. Second, people have a misconception about wildfires and the interface, believing that wildland fires roll through the forest, hit a built up area and keep rolling. But what largely happens is that embers from the wildfire are blown far ahead of the fire front and ignite flammable materials located around structures. These materials then either ignite the structure directly, or ignite something else (like a wood shed or deck) that in turn ignites the structure. This is what largely occurred in Fort McMurray. It is also what occurred in the Tubbs Fire in Northern California in October 2017, except the embers travelled very deeply into the urban core of Santa Clara, leading to the incineration of about 2,800 homes, mostly in the Low Risk part of town (as designated by the city’s statutory state wildfire risk maps). These maps apparently did not take the state’s often intense Santa Ana winds into consideration. Once you realize that wildfires are not juggernauts that roll through town like a steamroller and that structural ignitions from wildfire embers are preventable, then you can put programs into place to address the issue of flammability of individual structures, subdivisions and entire communities located in the interface. One problem I see is that we may be talking too much to the wrong folks; to wildland fire experts and not to structural fire experts, fire modellers and other urban fire experts. Now don’t get me wrong. Wildland fire experts, including fire ecologists and wildland fire suppression experts, are key throughout the entire lifecycle of a wildland fire – (long) before, during and (long) after. And we need to recognize that the condition and health of the forest around the interface community will largely dictate how intense the fire will be, the rate at which it spreads, and the amount of embers that are produced (the greater the fine fuels, the more embers). But once a wildland fire gets into town, the fire stops being a forest fire and starts a new life as an urban fire, possibly becoming an urban conflagration or ‘firestorm’ if enough structures are ignited (often via structure to structure spread of fire). So we have to recognize that once the fire hits town, it becomes a different fire, feeding on different fuels (like structures and vehicles). A fire ecologist, for example, has no expertise in the mechanisms that lead to structural ignition and spread of fire in an urban setting. Thus, we need to bring structural or urban fire departments and experts into the discussion and leverage their knowledge (of course, many are already involved in the discussion, but many are not). We have to pull in such organizations as the Canadian Association of Fire Chiefs, the Aboriginal Firefighters Association of Canada and their provincial counterparts, as well as provincial firefighter associations. We need to bring in such researchers as fire modellers, to better understand how fire grabs hold and spreads in urban areas (we know what causes structures to ignite, but need to do more to understand how entire subdivisions are lost) and the sequence of such spread. Some work has already been done in the fire following earthquake research area, and much of the learnings there can be carried over to wildland urban interface fire research. Essentially, we need to take the same approach with wildland fire in interface communities as we do with all other urban fires, including urban conflagrations. This can only start by talking to the right people.